I took this pic in Kenya last summer. 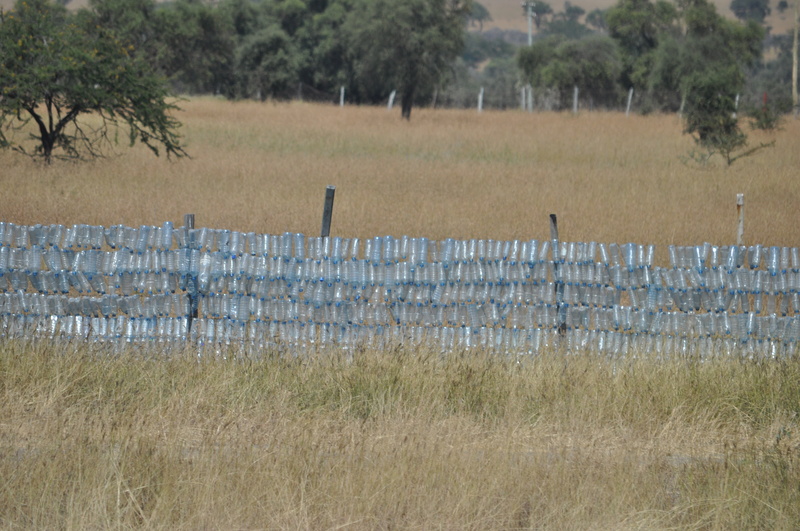 Those are discarded water bottles woven into a wire fence. Very creative! The musician Salieri says that at the end of the film. He has made a full confession to a young priest and finishes with that line. “You, too, are, mediocre,” he says in effect to the priest. “I, the patron saint of mediocrity, will speak for you.” He is referring to his musical talent as “mediocre,” but he didn’t always see it that way. As a younger man, he viewed it as a reward from God for his piety and devotion—until he was faced with the genius of Mozart, and realized his own talents paled in comparison. Not only does Salieri grow jealous of the younger composer’s gift, he is angry at God for giving them to such an irreverent man while he, Salieri, labors and toils “to the glory of God” and produces far less stellar work. In the film (which is based on a legend and not exact truth) Salieri’s jealousy sours him. He stops producing music and fixates on Mozart’s destruction. He allows Mozart’s music to silence his own. We all have that option. There are few geniuses; most of us muddle about in a state, comparatively, of mediocrity. But that shouldn’t dishearten us. It shouldn’t have disheartened Salieri. No, he was not talented to the degree Mozart was. But what if Salieri had music only he could create? What if his abdication of his talent resulted in something being left undone that was meant to testify to some particular facet of God’s creativity and beauty? Compared to Mozart’s broader testimony, perhaps Salieri’s would have been but a sliver, but when Salieri abdicated his talents, he failed to redeem a portion of the manifestation of God lost to mankind in the Fall. I’m extrapolating here in my application, but in trying to imitate someone else’s gift, or in failing to pursue the unique way in which God has gifted us (though it may be far less in scope and greatness than others), we “create” a lack. We “live” out and perpetuate the Fall. No, we in essence say, God is not purposeful and good. He plays favorites, and the amount of His love can be measured based on the ways He has gifted us. The cruel lie comes full circle when we believe we must earn God’s love and can do so only by exercising our talents; therefore, the lesser the talent, the less able we are to please God and “get” His approval and love. Scripture tells us this is a lie. God honors the widow’s mite; Jesus extols the woman who anoints his feet with her tears and wipes them with her loose hair. He flat out says He chooses the weakest among humanity. The Beatitudes praise those who accept their vulnerabilities. The Gospel “works” only when we admit how greatly we need it, how completely unable we are to earn it. So press on into your giftedness, no matter what it is. Press into it as part of God’s purpose for you, not as something you deserve, but as something He’s given so you can know and point to Him as the author of all good, of all creativity. Don’t compare your gift with others’ and don’t measure its greatness by how others react to it. Know (and remind yourself often) that since God gave the gift to you, He has purpose for it, and He is pleased when you exercise it. Your gift may not reach millions or even dozens of people. Your gift may be meant to touch only one. But to that person, your gift can be the touch of God. There is a wonderful by-product to this: when we view and use our gifts in this way, we do not begrudge others theirs. We can rejoice. We can encourage. Salieri hurried down the road to bitter envy. We, instead, can support others in their talents. When we do this, our gifts mingle and grow, and our creativity is not only a testimony to God’s imagination but also to His love. Early in Amadeus, when Salieri is still honored and praised as a gifted musician, Mozart listens to one of Salieri’s compositions. He immediately sits down, plays the piece from memory, critiques it, and then plays it again with his own vastly improved improvisations. Salieri’s face reveals his heart. He is shamed, and he is jealous. These are our natural reactions. But Romans tells us Christ has set us free from our natural “body of death” to think and live as redeemed people. How different might Salieri’s and Mozart’s stories have been had Salieri rejoiced in providing Mozart with an idea that Mozart was able to bring magically alive. Who knows what their partnership might have produced! God certainly creates geniuses, people touched to create in seemingly effortless ways—it’s a little glimpse of God’s work! But the rest of us, gifted to one degree or another, in one way or another, are celebrated in Scripture as a body—working in harmony, honoring each other—especially those whose gifts are less celebrated by the world—and together providing a shimmering image of Christ.